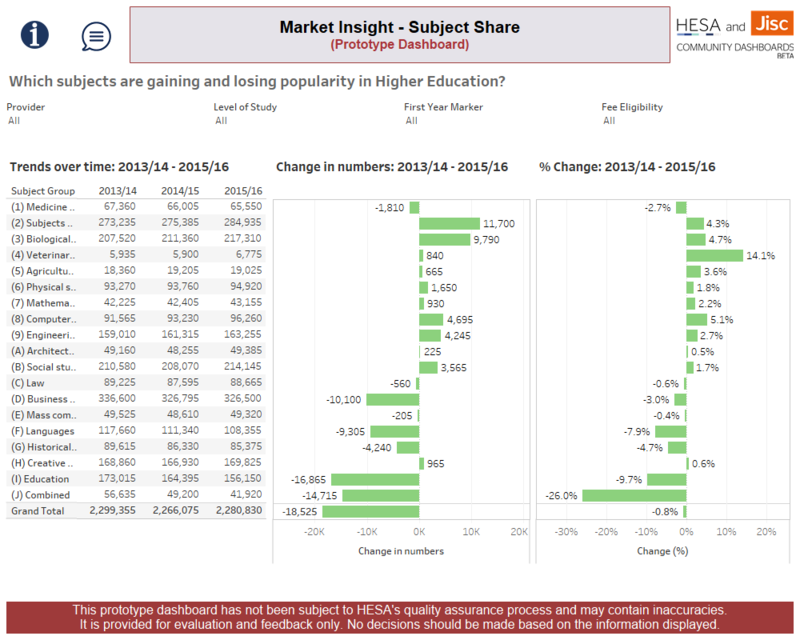 Community Dashboards within Heidi Plus were launched in September 2017, and now HESA and Jisc have launched Community Dashboard betas – to enable Heidi Plus users to review prototype dashboards which have been produced ‘by the sector, for the sector’. Beta Community Dashboards have not been quality assured and are published only for evaluation and feedback. The prototypes are available via Heidi Plus for users to evaluate, helping HESA and Jisc to prioritise the best for development and release as service quality Community Dashboards. These prototype dashboards have been designed and produced by teams from Jisc’s Analytics Labs. However, as they have not been subject to HESA's quality assurance process they may contain inaccuracies, so no decisions should be made based on the information displayed. Users are invited to use the new feedback buttons located within the header of each dashboard, to include suggestions for improvements and bug fixes. They are also able to vote on the priority of each dashboard for inclusion within Community Dashboards. TEF Metrics Core and Split Metrics. 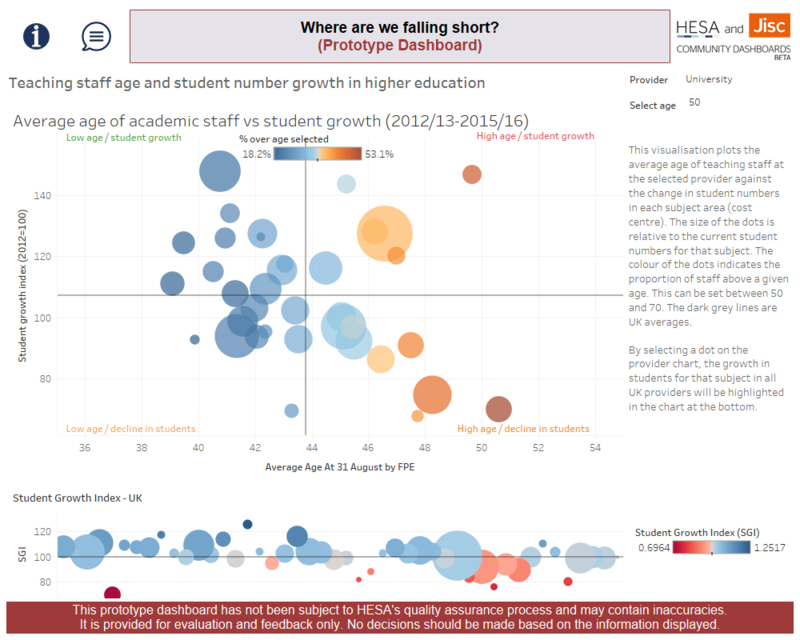 Jisc’s Analytics Labs enables data visualisations to be developed by the UK higher education sector, for the UK higher Education sector. The initiative brings together a range of staff to draw on their strengths and experiences, to identify common issues, acquire and explore data sources for insights, and so produce interactive dashboards for the benefit of the wider sector. Whilst Community Dashboards and Community Dashboard Betas are currently available to all Heidi Plus users at HE institutions and subscribing organisations, HESA and Jisc are currently undertaking a review of whether a charge for access to Community Dashboards will be introduced from 1 August 2018. This review is to ensure that the service is sustainable, due to the levels of resource it requires. We will keep Heidi Plus users informed as more information becomes available over the coming month. HESA (Higher Education Statistics Agency) is the recognised source of data on higher education in the UK. Its experts collect, analyse, and disseminate accurate and comprehensive statistical information on all aspects of UK higher education to support the strategic aims of its users and enhance the effectiveness of the sector as a whole. It is a charity and a company limited by guarantee. It operates as an independent organisation, working closely with higher education providers, regulators, funders, government departments, policy makers, and other stakeholders.